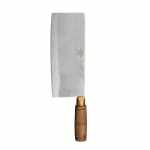 The Dexter 8915 08051 Chinese chef knife has an 8-inch long by 31⁄4-inch wide blade that easily chops through soft-skinned fruits, most meats, and vegetables. The flat part of the blade can easily flatten garlic. With its walnut wood handle, the knife has a traditional look. The Dexter 8915 08051 Chinese chef knife has a DEXSTEEL™ high-carbon steel blade that resists staining. "My husband, ( a great chef) bought one for me , I love it and use it a lot stays very sharp and so easy to use , love it !!" "my sister can use it,stays sharp"
"I bought this cleaver on the recommendation of the late Barbra Tropp, author of China Moon Cookbook. It is great to use and much friendlier than..."
great chef's knife ! !a must, will get one for my daughter ! "I bought this cleaver on the recommendation of the late Barbra Tropp, author of China Moon Cookbook. It is great to use and much friendlier than my old heavier big cleaver. A real winner." "Every kitchen needs one. Great for everyday use on vegetables, fruits, herbs, etc. Handles well. Has a clean, slightly curved, sharp edge. Can work in a chop or rocking cuts. A must buy for novice and pros."